You’re probably familiar with steel coasters and wooden coasters. But did you know that there is a kind of coaster that combines elements of both? The rides feature a wooden structure with a unique type of steel track. 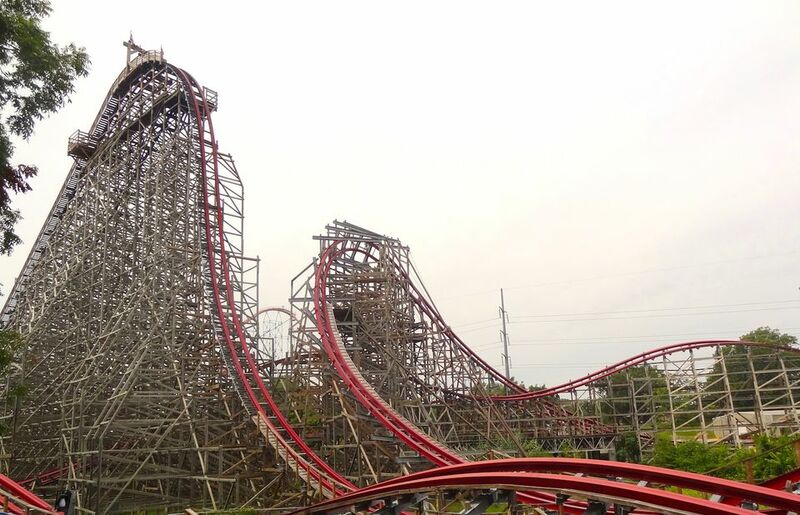 They are former wooden coasters that were past their prime and giving rough rides that were converted into hybrids by replacing their tracks and making other modifications. You can learn about them in our feature, "What is a Hybrid Wooden and Steel Roller Coaster?" They are uniformly wonderful rides. But some are better than others. Let's count down the top hybrid wooden and steel coasters. It has IBox steel track—all 5000 feet of it—that distinguishes hybrid coasters. But it also has twin lift hills and drops, a racing feature, and a storied past life as a movie star (really!). Read why Twisted Colossus merits a rare 5-star rating and is one of the best coasters (and possibly the best) out there. This is a tough call. Many consider Steel Vengeance, which opened in 2018, to be the best roller coaster at coaster-crazy Cedar Point as well as the best hybrid coaster anywhere. Others think it just may be the best roller coaster in the world, period. We agree that it is an incredible coaster. It climbs 205 feet, drops 200 feet at a 90-degree angle, hits 74 mph, includes tons of airtime, has an impressive 2:30 duration, and remains rock-solid smooth, despite its intensity. But, with Twisted Colossus' twin lift hills and racing feature, we think it narrowly takes the top honors as the best hybrid ride. It is worth noting, however, that the Magic Mountain ride does not always sync up to race two trains. Without the racing element, Twisted Colossus drops to second place, and Steel Vengeance vaults to the top spot. It climbs 179 feet, drops 171 feet at a precarious 81 degrees, and reaches a wild top speed of 70 mph. Oh, and did I mention that it races aside, atop, and into a stunning limestone quarry wall? When it was known simply as Rattler, it was a miserable all-wood coaster. After Six Flags transformed it in 2013 to the hybrid Iron Rattler, it catapulted to coaster greatness. The hybrid coaster revolution began in 2011 at Six Flags Over Texas when the park changed out the wooden coaster track of its Texas Giant coaster for a steel track and dubbed it New Texas Giant. It’s a wonderfully smooth—and just all-around wonderful —ride. Six Flags took another one of its aging wooden coasters, the Cyclone, and gave it a hybrid makeover. The result? It went from wicked rough to wicked awesome. We give it 4 stars (out of 5). It’s wicked awesome. Other hybrid coasters include Twisted Timbers at Kings Dominion in Virginia, Twisted Cyclone at Six Flags Over Georgia, and Medusa at Six Flags Mexico. If you are looking for more thrill ride greatness, check out the best steel roller coasters and the best wooden roller coasters. What Is a Hybrid Wooden and Steel Roller Coaster? So, You Think You Could You Handle These Six Flags Roller Coasters? Do You Have What It Takes to Brave the Best Roller Coasters? A Loooong Ride: The 11 Biggest Roller Coasters. Ride the 10 Fastest Wooden Coasters. Roller Coaster Airtime? What's That? What's New in 2016 at Theme Parks? Potter, Coasters, and More. What's New at Six Flags for 2016? VR Coasters and Lots More.